Bloggin Bout Books will have a review of the book! Kid Lit Reviews will be featuring a guest post by Steph and Dawn! Ever wonder what it's like to write as a pair? This guest post will give you some insights. The Family That Reads Together will have a review and a giveaway! Colby Sharp on Sharpread will be featuring an interview with Steph and Dawn. This isn't your typical interview though. His 4th grade class will be reading the book and coming up with the questions that they would like the authors to answer. How fun! Friday, March 29: A Day of Giveaways! Chat with Vera will have a review, and also a chance to win a copy of the book! There's a Book will also have a review and giveaway! Head back to Kid Lit Reviews to read the review of the book! If you follow us on the Facebook fan page for the book.) So make sure you follow us, check out these great blogs, and enter the giveaways! 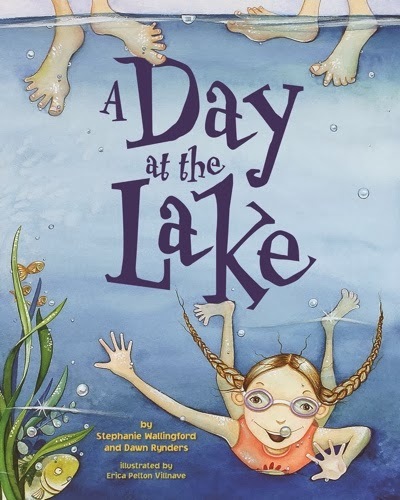 (And if you don't win, don't worry, you can still order A Day at the Lake from Amazon, Barnes & Noble, and your favorite local bookstore via IndieBound.) We hope you enjoy the tour!